Recently I met someone online. He lives near Marcoola, Queensland, Australia, which is about an hour and a half north of Brisbane by car. On the evening of Valentine’s Day, my new friend made a trip to the ocean, more specifically, the Coral Sea, home of the Great Barrier Reef. I’d love to visit him some day, perhaps grab a cappuccino at his local coffee shop. My new friend, however, would not be allowed inside the Bulli Café. He’s a Black flying fox (Pteropus alecto) named F7. I follow F7 via a mobile app called Animal Tracker. 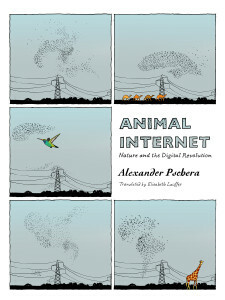 I first read about the app within Alexander Pschera’s nonfiction book, Animal Internet: Nature and the Digital Revolution, as translated from the German by Elisabeth Lauffer. In great detail, Animal Internet investigates the ways in which a wide-scale use of digital tracking devices will inform our understanding of and, therefore, our interactions with the natural world. Hobbies that were once commonplace and established the very basis of a human interest in nature can now be considered criminal: foraging for mushrooms, picking flowers, catching and observing animals, filling butterfly display cases and curating insect collections. This all used to be a self-evident part of a creative way to make nature one’s own, a way for humans to immerse themselves in natural space. In the vein of Hannah Arendt’s The Human Condition, Pschera reminds us of the dangers of this abstract relationship, or lack thereof, with the natural world. We’ve become grossly disconnected. Pschera does not, however, advocate for the romanticized vision of “going back to nature,” an ineffective popular and political platform, one that, amongst accelerating rates of carbon dioxide emissions, deforestation, and species extinction, has proven not only impracticable but truly impossible. Pschera writes, “There is no way back to nature. What may well be possible, however, is that emergence of a new image of nature—an image that is concrete and stimulates the senses, that breaks through the abstraction.” This could be the premise for our new relationship with nature. In some parts of the world, this technology is already facilitating a peaceful coexistence between humans and their non-human neighbors. In Kenya, “particular problem elephants that are known for running riot in […] impoverished farmers’ fields are equipped with special units that […] will send a text message to the rangers, who can then quickly locate and redirect the animals.” These endangered creatures are extremely intelligent. In fact, through these interactions, they almost always learn to avoid these routes. Clearly, this is not only an example of humans observing non-human animals, but of two-way communications. F7, my newest virtual friend, cannot send me a selfie via the iPhone 6. However, I check in on him every day. In fact, I visit Animal Tracker more often than Facebook, and I anxiously await an increasing number of opportunities to communicate through the greater Animal Internet. The system allows for the democratization of information as it’s tracked, transmitted, processed, formatted, and distributed. Even today, biologists, hobbyists, and schoolchildren alike can witness F7’s activity via Animal Tracker. Pschera asks, “What happens when wild animals start pinging us, and we are able to identify them as unique individuals with their own backstory?” As Pschera suggests, perhaps someday it will be difficult to remember life before the Animal Internet.